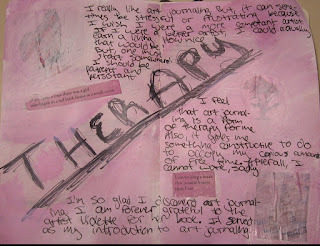 Extraordinary Erica: My first decent art journaling page! My first decent art journaling page! Here is a page I did that I actually like! I am trying to add more layers to my art journaling pages. So, I started out by writing with a Micron pen on the blank page. Then, I painted on a layer of white gesso. 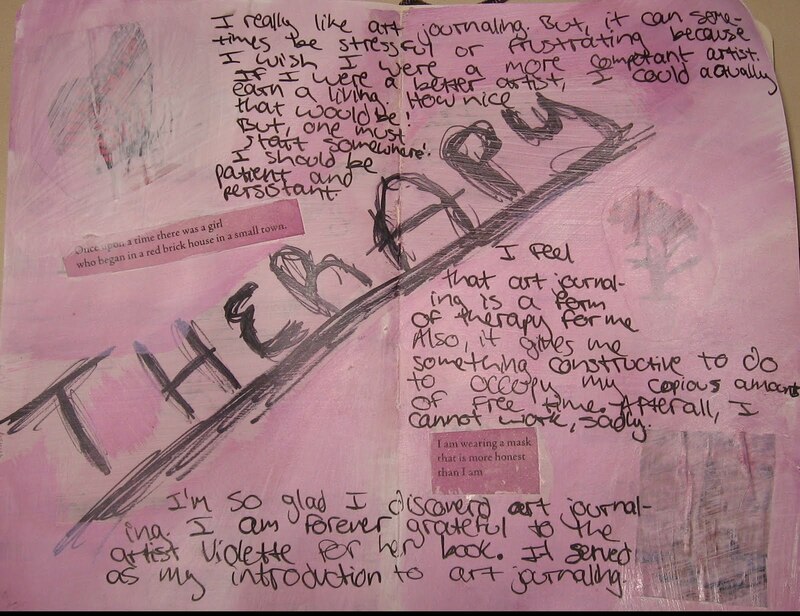 Next, I used a Sharpie to write "Therapy," added three pictures that were cut out from magazines, and added two textual elements I cut out from a literary journal. I then added a layer of white gesso over the three pictures. Finally, I painted over the entire page using Twinkling H2Os (a brand of shimmering watercolor) from LuminArte. I completed the page by adding more writing. Great start! I love the H2O's, it's too bad they just don't show up that well in pictures. Yay! A page you like. I'm sure there are many more coming up. There are so many ways to make pages, you'll even come up with your favorite style. Great page! The layering looks good, doesn't it? Keep up the good work!!! Very cool! The more you do the more you'll love your pages. :) I love layering on my pages. Great start Erica. I am particularly drawn to purple. I love your page. Keep at it. Even though I still am a newbie to art journaling, I have a few pages I love. That when I made them I FELT like an art journaler. This is a great page. Keep them coming! nice. i like the sentiment behind it and the 'keep on going' attitude. and i love the color. You're doing great! The color is really relaxing and I love those quotes. I know how you feel about it being stressful though. I have opened an etsy, bought a business license, got my seller's permit and even thought of a logo and line, but I feel trapped like I can't make anything because I'm afraid I'll fail. Just like any skill, you learn things as you go along. There's really no such thing as being a better artist, because we all have our own style. It's like comparing apples to oranges!